You’ll soon start seeing self-driving cars being tested on the streets of New York City for the first time, although you might be surprised by the company involved. It’s Cruise Automation, the self-driving car division of General Motors, and the team apparently beat out all other companies that’d applied because it was willing to abide by New York’s tough rules, which were introduced by Governor Andrew Cuomo back in May. GM, though, seems ready to tackle that risk as conditions in New York may help give it an advantage over competitors. "Testing in New York will accelerate the timeline to deploying self-driving cars at scale. New York City is one of the most densely populated places in the world and provides new opportunities to expose our software to unusual situations, which means we can improve our software at a much faster rate," said Kyle Vogt, CEO of Cruise Automation, in a prepared statement. 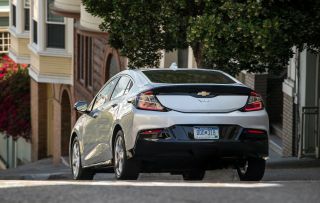 New York's rules include the need to insure each of the fully automated Chevy Volts involved in the tests for $5 million and heeding restrictions such as staying away from construction or school zones. Not only that, but GM will be expected to cover the costs associated with having police and other authorities oversee the tests. And then, unsurprisingly, GM will need to abide by the now-familiar standby of keeping a driver in the seat at all times in case something goes wrong. In addition, another person will have to remain in the passenger seat. As The Wall Street Journal notes, the tests themselves will be restricted to a five-square-mile area of lower Manhattan and are expected to begin sometime later next year. Get past all that, though, and New York officials seem relatively excited about the prospect. “New York is the ultimate proving ground for autonomous vehicle technology,” said Gale Brewer, president of the borough of Manhattan, in a statement. “We have a streetscape that is unrivaled in its scale and complexity, and so it's fitting that General Motors and Cruise Automation are finally bringing this technology here for testing and development." Other tests of self-driving cars are currently being conducted in California, Arizona and Pennsylvania, with Uber being the primary driving force in the latter two cases. It hasn’t always been a smooth ride, as we saw in the case of a self-driving car that got tipped over in an accident in Tempe, Arizona last March. In that case and others, though, human error on the part of the other driver was to blame, lending credence to the frequent claim that self-driving cars would actually make our streets safer. Driverless cars: a big problem for the unskilled youth of the future?